Skylum has announced Luminar Flex, a new plugin that enables photographers to leverage Luminar's features while using editing software from other companies. Luminar Flex joins Luminar 3 to offer the company's AI-powered features, including Accent AI and AI Sky Enhancer, as well as Looks, Foliage Enhancer, Details Enhancer and more. 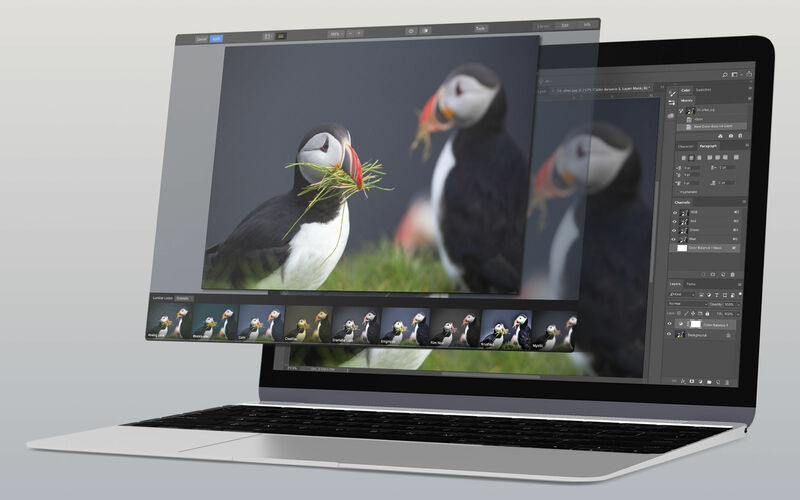 In addition to offering the Luminar array of AI-powered features, the Luminar Flex plugin also brings Workspaces, the collections of filters designed for different types of photography. Skylum has introduced a new set of Workspaces specifically for Flex users, including Drone & Aerial, Film Lab, Expert, Black & White, Image Aware, Intensify, Relight and Color and Portrait. The Luminar Flex plugin supports Adobe Photoshop, Photoshop Elements, Lightroom Classic, and Photos for macOS. For Lightroom users, Luminar Flex brings support for Layers and Blending modes, enabling users to apply filters to layers, and both filters and textures to blending modes. Luminar Flex supports Smart Objects in Photoshop, as well. Ultimately, Skylum says it recommends Luminar Flex to photographers who want access to Luminar's features as part of their existing workflow rather than transitioning to Luminar 3. Skylum has given Luminar Flex its own development roadmap separate from the existing Luminar product. Both existing Luminar 3 and Luminar 2018 product owners will get Luminar Flex for free in their accounts starting April 4. For everyone else, the new plugin costs $59 / €59 / £54. After a lot of mucking about, I have got this working with Windows 7. The problem is that by default it will install the plugin into the users\admin\appdata\roaming\adobe\lightroom\modules folder. And I dont run programs in an admin account, but have a downgraded privileges user account - which is best practice with Windows - even in Windows 10, but certainly in 7. So copy all the flex folder in your proper user folder instead and it works. Its still quite slow though and I'm not sure how much I will use it to be honest. Since the product first came out with its old name, I have been pretty horrified by its over-cooked HDR look. At PDN, I was expressing this at their booth, and they showed me examples that weren't over-cooked, except that they were still very over-cooked. I think there's more opportunity here than the company realizes if they could simply crack the code of creating beautiful *natural* looking HDR photos. I tested it together with Apple Photo. Makes a nice combination, I think I'm really going to like it. Have tried it. Installed in my LR CC perfectly. But I wanted it in Photo's. No deal. Just is not installed... Anyone? I think you have to open Photo to see it. If not there try reinstall. 1. Install as administrator (in case you have more than one user). 4. Extension should be available and activated for each user-account on your system separately. For me on Mojave it works. Although I have high sierra, I tried it. It didn't work. Other extensions in Photos like DXO or Filters bought in the App store work fine in Photos. And again, Flex works in LR and as a standalone. But not in Photos. Damn. Open Luminar Flex, then go to install Plug ins. Might be that Photo installing was not activated. Good man, or woman, if you are one, this worked! Thanks. Now I can properly test it! Yeahhhh ! Another software to steal your money !!! IA will NEVER replace the editing YOU chose to do in your image. Lr and Ps are powerful tools, stop the laziness and learn the damn thing, for Christ sake ! Did your parents ever told you the easy way is never the good way ? Downloaded the Trial- it finds Apple Aperture and works well with it.Doesn't seem to find Apple Photos in MacOS Sierra 10.12.6. I understand , it can be used in upto 5 Macs. I think it is automatically installed for Photos. I saw the same thing you did when I did the installation but when I start Photos I do see Lunimar FLEX there. It can automatically be found in Photos (that confused me, as well). I look forward to taking some new pictures this weekend and playing around with Luminar Flex. Looks like I had a special issue. MacintoshHD folder had Applications as empty and the Applications folder was elsewhere ! When I pointed to the root Applications folder during Installation- it installed correctly for the Photos app. Just installed it. I am running Photoshop CS6 and Lightroom 6.14. It works fine in PS from the filter menu. It also works with PS as a smart object which is very cool. I still think the whole process is quite slow, and I have a decent spec PC - but it works. However not on Lightroom. I have a feeling it may only work in Lightroom CC Classic. Am waiting to hear from their tech support about this. You'll get a company representative reply to you, telling you that your issue will be looked into by their team of programmers, but then nothing will happen after that. That's been my experience with Skylum's "Tech support". Works for me in LR 6.14 with no issues. I got replies from Skylum Staff because I was having trouble receiving the activation code. Marco, are you on Mac or PC? I'm on Mac. So far the plug in looks nice, but I'm still getting used to it. It will be more interesting when more styles will be available: right now they seem to work only with the Luminar stand alone software (I don't have it), I just sent an email to the support staff to see if there's a way to add them to the Flex version. @beacher I got almost always a quick reply from the support girls. They actually helped to install more Looks in the app. (In case you want to do it, download and unzip the files, then open Luminar Flex as a STANDARD ALONE program. click File, add Look, choose it, and done). I'd rate the support of Skylum 5/5 stars. Did anyone actually receive Flex in their account? As a current Luminar 3 owner I havn't seen it yet. One has to be fair with Skylum / Luminar. Fair game to criticize when they constantly push delays of their promised DAM, and criticize when it launches.. But when they deliver a plugin to avoid just that.. free for Luminar users, that's a positive I'd think! Are you sure ? https://skylum.com/fr/luminar/roadmap still indicates the most basic DAM features as in development or only planed : IPTC edit and search. Of sorts. Very basic. When they meet their roadmap it may be OK.
How is this different from using Luminar as a plugin previously? Waiting to see. Hopefully it will be a lot quicker and more seamless in the flow than firing up the entire program. Well, it looks like it takes your long panorama with a white background and squashes it into a 4:3 ratio with black borders. So there's a win! Someone should have told the guy in the video that Marketing decided to name it Luminar FLEX instead of Luminar Plugin. The mention of a separate roadmap for this caught my eye so I went looking and didn't find it. I did take a look at the Luminar roadmap and see that the February-March 2019 update seems not to have happened yet. Nice to see that it is still business as usual with Skylum. Luminar actually changed the name only a week or so ago — it was originally going to be called 'Luminar Plugin,' which is why the video shows it as such. It was originally supposed to launch in late March, but it got pushed back to today. So I guess business as usual for Skylum with their normal lack of foresight. Looks like they recut the video to use Luminar FLEX in all of the screenshots. The screen over the shoulder shows Luminar Plugins in the menu bar. They really should have redone the video since the end result shows that this company just doesn't have it's act together. I really want Luminar 3 to replace LR for me but what was delivered falls short and has left me waiting for more updates. In that intervening time two new products have been released. Cool, I look forward to trying this. I bought Luminar 2018 and like it for a few things, its got some nice tricks. Then I got Luminar 3 in the hope that I could leave Lightroom 6. But its not up to the job and very slow so I uninstalled it and went back to using 2018 as a plugin. Now this sounds perfect as it seems like it has all the power and tools of Luminar 3 but just as a plugin so it should be a lot quicker to deploy. I am going to try that thanks ! Wake me when it becomes available for Affinity. Thank you. I saw this yesterday before the official announcement - so I purchased it. It works superbly!!!! Now you can have all of your Luminar functions and filters available right through Photoshop - it's great! Of course, if you own the stand alone version of Luminar, unless you want these options available in Photoshop, getting Flex may be overkill. But since I do everything in Photoshop (after RAW conversions), this Flex just is the icing on the cake. "We used machine learning to analyze thousands of images of sky and we can recognize what's sky and what's cloud"
This is the AI bubble equivalent of your cab driver recommending stocks in 1999. Why should AI be a bubble? Like the internet, it isn’t going to go away. It may receive to much attention ... but the technology is here to stay. And we’ve just seen a glimpse of what’s to follow. @Falk, AI is in a bubble because everyone is referencing it even for trivial algorithms that don't require it. The stock market didn't go away after the bubble, and neither will AI, but once we worked through the hype and also-rans we'll be left with a stronger, more sane market. Not to sound crude, but the examples on their website look like cheap Instagram filters. More overcooked pseudo-HDR stuff with the usual oversaturation and borderline cartoon look that seem to be the norm on social media sites. I guess Luminar 3 and 2018 owners (users who bought the Software license) will also get it for free, and not just both the existing product owners for Luminar 3 and Luminar 2018. To Christian - no, it's not for free - a separate purchase. Yes, it’s 100% free to Luminar 3 and Luminar 2018 users. Skylum is proving to be a decent and fair company, unlike someone else we have come to depend on over the years. Their stronghold is finally losing its grip. Too bad that Luminar’s Library feature is not yet at the same level as Lightroom’s. Luminar Flex is free for all Luminar 2018 and Luminar 3 users. If you have purchased Luminar Flex, please, send me the proof of your purchase (including your MAC order number) and we will issue a refund. Use one of the links below to download Luminar Flex plugin. " That's good news. There should be a way to activate using your existing Luminar 3 credentials/serial. Unless I am missing something, it sounds like they will be dealing with a deluge of similar emails, starting with my own. Yes, they also replied in a subsequent email that the same code for Luminar will activate Flex - so all is good there. Now I'm just waiting for that $59.95 refund. I knew I should have waited a day and thought this through. But hey, the software works great in Photoshop.